Critical Miami: What's up with Pit Bulls? That’s on the ballot for Miami-Dade residents on August 14th. We’ve got one of the oldest of the municipal bans on pit bulls in the country, and now it’s up for reconsideration. Let’s put aside the typically idiotic language of the ballot and consider the the matter. Despite the blowhard arguments made by some pit bull advocates (see image), it seems to be not obvious what the right thing to do here. Banning anything is an invasive government action, and it needs to be well justified before it can even be considered. Are pit bulls more dangerous than other breeds? And if so, is a ban the correct response? Here is a report of dog bite statistics by breed covering almost thirty years. Scrolling through the list is sobering. For “attacks doing bodily harm,” most dogs are in the single digits. Some are notably higher: Boxers, 48; German Shephards, 89; Labradors(! ), 45. But pit bulls stand head and shoulders above them all with 1970 attacks. But wait, there’s also information about the percentage of the dog population some of the breeds account for, and pit bulls, at .033, are actually very high up in that sense. Well, luckily I’ve crunched the numbers for you. Here’s a handy dandy Excel spreadsheet (csv) which includes only the breeds for which the species percentage is given, sorted by the score (column H) that weighs the number of attacks against the prevalence of the breed. According to this chart, Rottweiler’s are far and away the most dangerous breed, followed by Wolf hybrid, followed by Pit bull terrier, Bull mastiff, Akita, Boxer, and Chow. Labradors, German Shepherds, and Great Danes round out the top 10. But even within the top 10 there is a fast and significant drop-off. 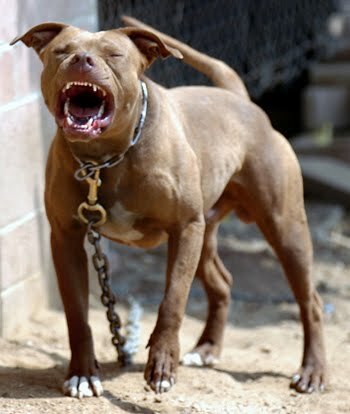 A pit bull is 10 times as likely to attack a human as a German Shepherd. A Rottweiler is 13 times as likely to attack as a Boxer. Taken on its face, the statistics show that the top few breeds are indeed much more dangerous than all other dogs, per individual animal. Together, pit bulls, Rotweilers, and Wolf hybrids account for 77% of attacks that induce bodily harm. There are two big problems with these numbers. First, they don’t take into account total populations. They compare breeds against each other, but say nothing about how dangerous, statistically, a given animal is. If you’re confronted by a pit bull, what are your chances of being harmed? Or to put it another way, for an individual pit bull, what are the chances that it will bite a human in its lifetime. 1 percent? A tenth of a percent? A thousandth of a percent? It seems crazy to consider banning anything without this information. Perhaps just as important, the statistics are compiled in a way that’s not quite scientific. They’re based on media reports. That means they’re subject to all kinds of bias: people underreporting bites by smaller or less “threatening” species, people assuming that a dog was a pit bull in part because it bit someone, and other issues concerning identifying a breed. The Center for Disease Control has pointed out that these studies are unreliable. Q. “It’s not the dog — it’s the owner!” Any species of dog can attack a human, and most of the so-called “dangerous” dogs are perfectly loving and well-behaved companion animals. Some people raise dogs either incompetently, or in a way that makes them deliberately aggressive. Don’t punish the dogs and the vast majority of responsible owners. A. We’ve tried punishing the owners. In some cases, owners have been fined as much as $7 million, and any dog that seriously bites someone is destroyed. We’ve tried education. And yet attacks by pit bulls and other dangerous breeds are on the rise, despite laws banning and restricting the dogs in areas around the country. It may be the owners’ fault, but that’s just as much of a reason to ban the dangerous breeds. Q. “Pit bull isn’t even a real breed” The term can refer to a number of different breeds, and legislation usually adds the phrase “and similar dogs.” How can you pass a law when the situation is such a mess? A. All dog breeds are a human construct. Some are better defined and some less well defined. Strictly speaking, when we talk about pit bulls, we usually are talking about the American Staffordshire Terrier, the Staffordshire Bull Terrier, The English Bull Terrier, and the American Pit Bull Terrier. You identify a pit bull the same way you identify a more strictly defined breed: a casual identification by sight, and verification by DNA test. Q. Here, let me show you some tragic stories of children maimed and killed by pit bulls Isn’t any death tragic? A. Of course it’s tragic. But we’re trying to have a society here, and we’re dealing with lots and lots of people. Look at how many people die in car accidents. What if it turns out you could save more lives by banning car radios (on the logic that car radios distract drivers and contribute to accidents)? What if it turns out you could save more lives by banning the use of car radios just on Sundays from 2 to 5 pm? Neither side in this debate makes a good case. The pro-species-specific bans throws out deeply flawed and incomplete statistics and emotional accounts of individual cases. The pro-pit bull side argues that most dogs are harmless, and spend time refuting “myths” that nobody actually believes and ignoring the evidence that some breeds are more likely to bite, and more likely to injure and kill when they do bite. In the end though, the conclusion is simple. 207 people were killed by pit bulls in the study we cited (the study from DogsBite.org, a pro-ban website). That’s 11 people per year, in a country of 300 million. Your chances of dying in a dog bite in a given year are somewhere in the range of 1 in 27,000,000. But actually there’s more to it than that: 75% of dog attacks occur on the owner’s property. Only 1% involve pit bulls being walked on a leash in public. Don’t like pit bulls? Don’t go to people’s houses that own them, and call the police when you see someone walking one without a leash. 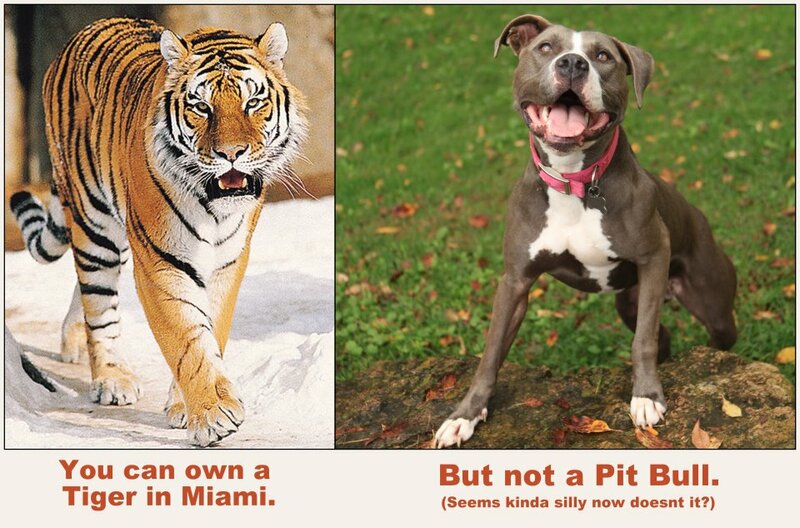 The referendum to lift the Miami-Dade pit bull ban is worded terribly. It’s a result of the State of Florida threatening to overturn the ban, which is pretty irritating. And it may seem counterintuitive — even if the ban is wrong, it’s been in place so long, so why lift it now? But the ban was wrong when it was enacted, a knee-jerk reaction to news events. Lifting the ban is the right thing to do.